Microgaming’s Immortal Romance already has legendary status in the online slot world, but what is it that makes Immortal Romance such a powerful and popular online slot game? Immortal Romance slots is one of Microgaming’s most played and most popular slots. It could seriously be a contender for one of the most played online slots of all time. 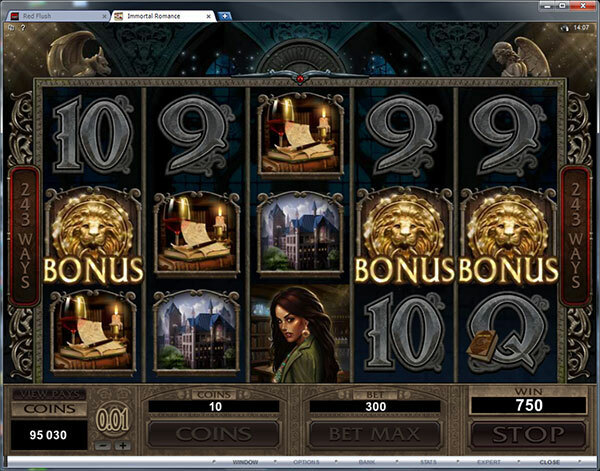 The slot itself is a tale of love between vampires and people. Although this genre is taking a bashing at the moment with so many cheap vampire love stories, this slot provided a first in the gaming world. It was one of the first story styled slots that is a slot with a storyline which develops as the game is played. Immortal Romance Slots has five reels and comes with an unchangeable two hundred and forty three pay lines. Why you would wish to change that is beyond anyone’s comprehension, because the game has all of the pay lines activated for a positively cheap figure. Immortal Romance slots also heavily features scatter cards and contains a free spins bonus round. The Immortal Romance logo becomes a wild card in this slot game and does typically what all wild cards can do; substitute itself for another card (barring the scatter symbol) and award The stories in Immortal Romance vary, but all can be learned as you advance in the game itself. The overall look and feel of the game is rather dashing, and mystical, as you might probably have expected from a vampire slot game. Immortal Romance slots also relies on its bonus games to provide an added sense of suspense and then tension to the game. These although difficult to access do send the story hurtling towards you at a rapid pace but does little to assist you in bagging a 60,000 coin jackpot. Immortal Romance also offers free spins and multipliers, which can be used to enhance any winning pay line.